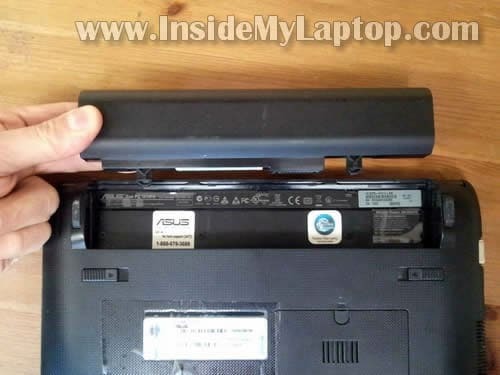 In this guide I show how to disassemble an Asus Eee PC1015PX netbook. My main goal is replacing the hard drive which started to fail. In order to remove the hard drive it will be necessary to remove the top cover assembly. The hard drive mounted deep inside the netbook case. Lift up the screw cover located on the memory cover. Remove the screw. Lift up and remove the memory cover. Under the cover you’ll find one memory module. Asus Eee PC 1015PX has only one memory slot. This laptop can take 2GB RAM maximum. Memory type: DDR3 PC3-10600 or DDR3 PC3-8500. Remove four screws located in the battery compartment. Start separating the keyboard assembly from the base. You can use a piece of soft plastic to separate two parts (I”m using a guitar pick). There are small plastic latches securing the keyboard assembly. 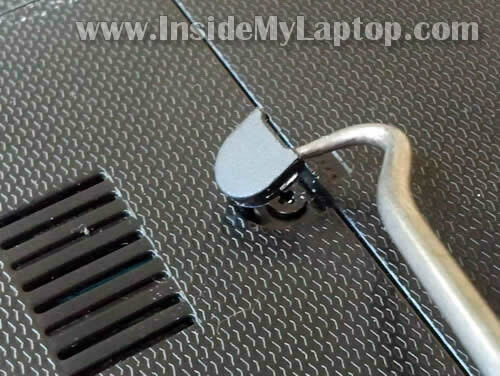 Lift up the top side of the keyboard assembly and slide it towards the screen. 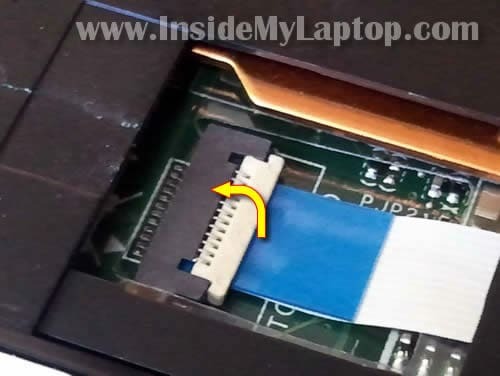 Now you can access the keyboard cable connector which is located under the keyboard. Before removing the keyboard you’ll have to unlock the connector and release the cable. Here’s how to unlock the keyboard cable connector. 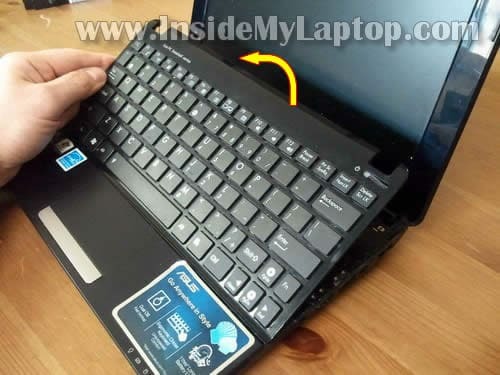 Move the white locking tab about 1 millimeter towards the netbook display. The cable jammed between the locking tab and base. Lift up the right side of the white locking tab with your fingernail. The locking tab will open up at a 90 degree angle. The locking tab must stay attached to the connector base. Now you can pull the touchpad cable from the connector. I’m using the same guitar pick as a case cracker. 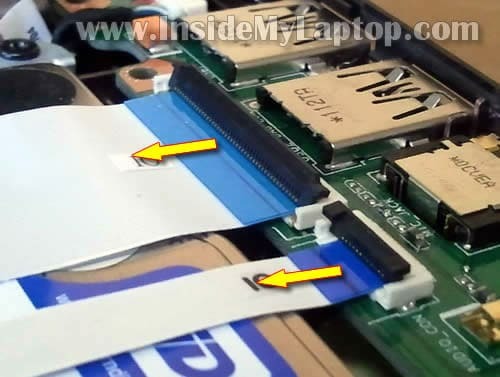 As you see, in Asus Eee PC 1015PX netbook the DC power jack soldered to the motherboard. If the DC jack fails, it will be necessary to remove the motherboard for the jack repair. While the top cover is removed, take a look inside the cooling fan. If the fan looks dusty, blow off the dust using canned air or air compressor. The hard drive mounted under two cables connecting the USB board with the motherboard. Disconnect both cables from the USB board. 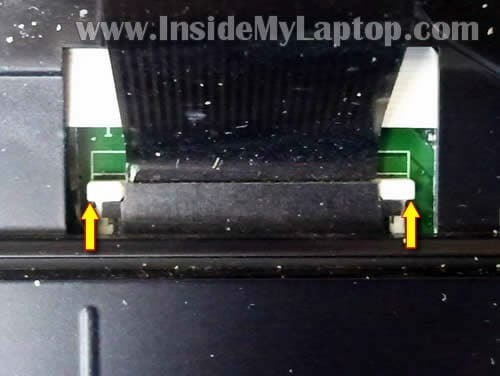 Unlock both connectors the same way you unlocked the touchpad connector in the step 12. Remove both cables from connectors. 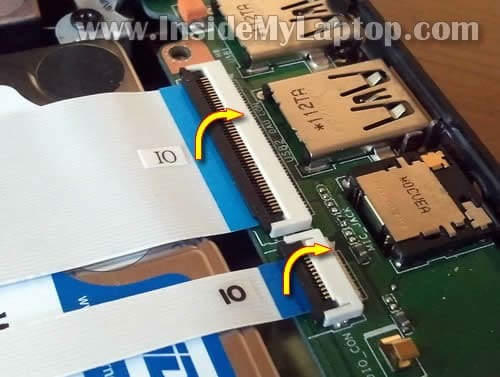 Lift up the right side of the hard drive and slide it to the right to disconnect the hard drive from the motherboard. The hard drive has been removed. My Asus Eee PC 1015PX had a regular 2.5″ 250GB SATA hard drive installed. You can replace it with any other large capacity 2.5″ SATA hard drive or SSD. Do you know where I could get spare parts for these acer netbooks ? Hey, thanks for this great article! I have been searching forever on how to open this thing up so I can remove the hard drive and back it up to my desktop. Thanks again! Is there a mini PCI-E slot on the motherboard? Is there wifi adapter attached to a mini pcie slot? I was wanting to replace the wifi adapter with a SSD. You missed one screw in Step 11 – just by the cooling fan, almost at the end of your yellow arrow. Thanks for the guide! after removed the keyboard, and reinserting the keyboard back in, the enter key and backspace key on my keyboard do not work. Any idea why that happen? Check connection between the cable and motherboard. Try reseating the keyboard cable. Could be just loose connection. I have done that many times, it seems does not solve the problem. Is there only one that the keyboard cable can go in? The first time I reseat the keyboard cable it worked fine. The second time, some of the keys do not work. Yes this is the only keyboard connector. Look inside the connector. Maybe you got some dirt stuck in there? Just guessing. Thanks! The 1015PX looks similar to my 1225B except that the keyboard and touchpad make one piece. It would be nice if somebody coud disassemble 1225B. There are two screws under the battery and two under the RAM cover (the RAM modules are soldered to PCB though making the RAM cover totally useless). But my Eee PC 1015 seem to have a different problem. I was working with it when suddenly the internet network failed. I decided to watch movie with it till it was restored. When the network came back, I tried typing but then I discovered that only few keys were working.The spacebar was only changing the power mode. other alphabet keys are serving as arrow keys and most of the alphanumeric keys show different things when typing but it shows they are working. Please what can I do and my laptop has this arabic signs on it which I dont understand there meaning. Thanks for the instructions. They were quite useful in disassembling my Asus Eee PC 1015PED. 1. The three tabs above the screws in the battery well. They need to be gently pryed out. 2. Two retaining clips at the bottom of the side walls of the battery well. These need to be pushed in with a small flat screw driver. Only after these two steps you can start removing the keyboard with the guitar pick as you have described. was the upgrade to SSD worth the work. did you get a remarkable speed increase? This is testament that Asus doesn’t want you to replace the hard drive. Plus one slot for RAM. Instead they want you to buy a new netbook. Shame on you Asus. OK but how to disassemble screen to replace for instance broken LCD???? 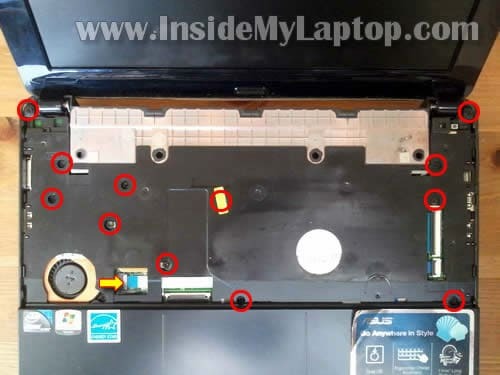 how much speaker on board asus eee pc 1015cx note book? hi, my notebook of this model cannot be switched and during that problem occur the connection of the charger cannot be detected by the notebook? why is that so? Thanks for all these explanations. I succeed in disassembling my new Asus Eee PC1015BX netbook. In fact, I try to reset the Bios password in vain. Do you how to do ? 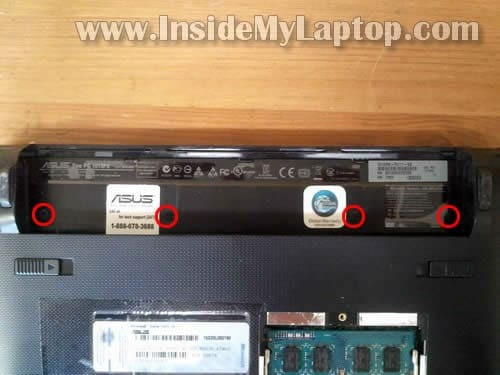 “How to BIOS reset ASUS EEE PC netbook and remove BIOS password” http://www.guruht.com/2011/11/how-to-bios-reset-asus-eee-pc-netbook.html. Thanks for such descriptive info. My question is which screw driver I need ( size of screw driver) to open its screw as shown in step 2. Just at top of RAM. I am planning to upgrade the RAM. Also which RAM I should by for Asus EEE pc 1015PEM? any 2GB DDR3 ram will do ? My question is which screw driver I need ( size of screw driver) to open its screw as shown in step 2. Just at top of RAM. I am planning to upgrade the RAM. Probably Phillips PH1 will work just fine. According to Crucial, it’s 2GB DDR3 PC3-10600. Excellent instruction – very helpfull, I managed to remove dust from inside. I would like to say, that there are two screws you don’t need to touch, and I am not sure if you should. 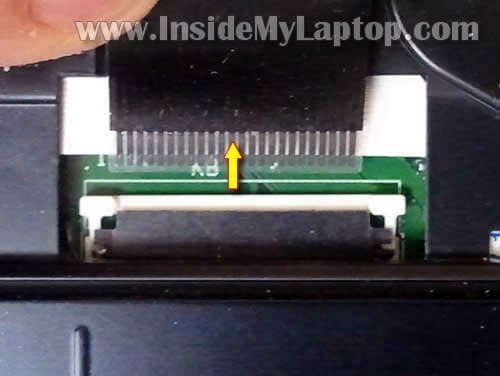 In step 11 you may leave screw next to touchpad connection (right from it) and the first one above it. they hold heatsink and I am not sure if detaching that bit is ok if you don’t have heat conducting paste. Also if you have a paste it is fairly easy to clean or replace the fan, but still all of it is medium level of difficulty. Hi, thanks for this guide it really helped. I rescued my netbook with a broken power supply that would not charge no matter how much I wiggled the lead. It turns out that the back had come out which houses the centre pin. I got a spare off ebay for a couple of quid but I am no solderer so I managed to push the back section back into place and behind it wedged a small piece of clothes peg I cut to size to prevent it being pushed out again. I replaced the cover and its now held firmly in place! Hope this helps others out there, these charger sockets are so prone to breaking with people tripping on or yanking the charger wires. Excellent, however, I have the same device, but when I open the memory lid, there is no memory., but a heatsinc like part is shown. So this is a deviant motherboard. 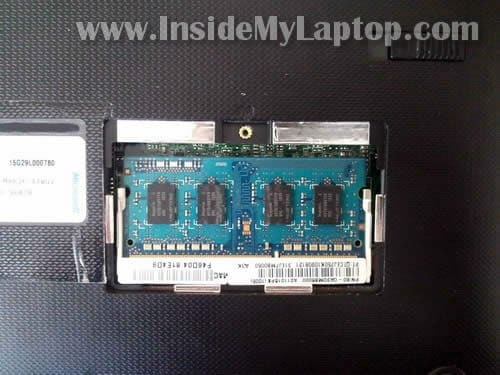 Is it still possible to replace the memory with an upgrade by disassembling the the notebook completely, because I would have to get to the underside of the motherboard for me to see if the memoryslot is yet located there. What is your laptop model number? This Asus Seashell notebook reports under Configuration – System: ASUS EeePC 1015BX. It has a lid underneath, where you would expect the 1Gb memory to be located. Opening up the lid reveals an unpleasant surprise: no memory bank but some unknown parts. I believe this model (1015BX) has RAM soldered to the motherboard which cannot be removed, replaced or upgraded. Unfortunately, I cannot find a good image of both sides of the motherboard to confirm that. Hello ive got a prob.. Under step 17, disconnecting cables. What if my connector is pulled out? (Broken) due to excessive force while pulling up to remove cables. I have the same device as mention above, I’m facing a problem now which my net book can’t detect hard drive even though I already replace a new hard drive, may I know what is the problem and how to solve it? Thanks in advance. I don’t know. I looked up both models on Asus site and they look very similar. You’ll have to compare both motherboards side by side and if they have same dimensions and connector locations probably you can do that. Mine is Eeepc Asus 1015px is it advisable to change the hard drive it’s hanging when I play a movie and sometimes the screen becomes color blue and sometimes so slow. Kindly give me some advice regarding this matter do I have to upgrade the hard drive, the advantages and disadvantages. Mine is Eeepc Asus 1015px is it advisable to change the hard drive it’s hanging when I play a movie and sometimes the screen becomes color blue and sometimes so slow. The symptoms you described could be related to hardware OR software. First, I would run tests on the hard drive and memory. For testing hardware you can use utilities on Ultimate Boot CD (google it). Hi I have the Asus Eepc 1015PX Seashell. 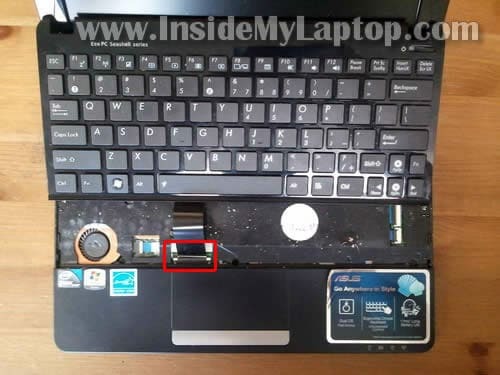 Thank you for the really helpful guide to removing the Keyboard, but do you also know, (or can you guide to any links), how to separate the keyboard from the main upper case part of the laptop? In all the sites where I see the keyboard for sale, it is not the complete top with cut outs round the hinges, it is just the keyboard only. Thanks in advance for any help that you can give. Please include more steps/details for removing keyboard assembly, I ended up separating the cover from the keyboard. The thing was held on by a bunch of 1mm wide pegs that fit into the metal backing and melted at the tips to hold it together. Luckily the cover is made of ABS plastic so some nice runny modeling glue should hold it back together. If you are going to take apart a complex package like this, and write instructions for others, please include much more in depth instruction! Everyone else, please consider using a professional service for this. A desktop is one thing, even standard notebooks are easier than a netbook in certain aspects. Yep. Okay everyone. If you are planning to disassemble your 1015px netbook, DO NOT ATTEMPT!!! 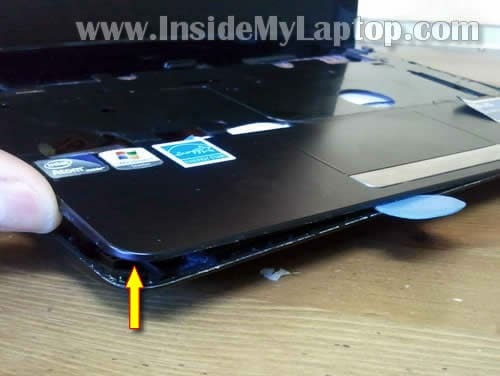 I am very savvy when it comes to this stuff, and I don’t know how many perfectly good netbooks this guy went through to do this, or if the thing looked even half decent when he was done. 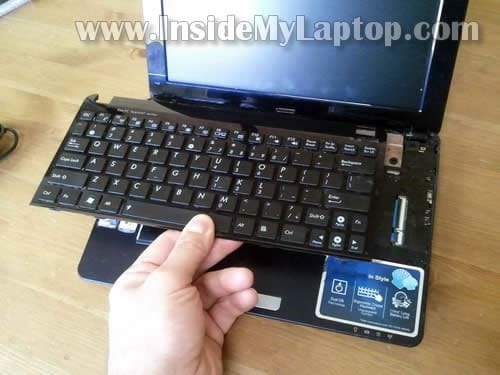 Bottom line is, if you absolutely have to do something with your netbook like this. Bring it to a professional!!! Do not try to do this yourself! The step of removing the RAM cover doesn’t even make any sense if you are trying to switch out the hard drive! I should have known from that step alone that this was a bad set of instructions. I stopped before completely removing the cover, (after the keyboard), and put the thing back together. My netbook is destroyed as far as appearance, and my keyboard, as I mentioned in my last post, is separated from the top cover, so now my keys are basically flush with it. That must be some magic guitar pick this individual was using there too. There are too many variations in the design for these computers, one batch is not necessarily identical in design and parts. I am lucky I stopped when I did. I can still at least use my computer. The way I see it, you sir are not owed a donation, you sir own me a brand new Asus Eee PC 1015PX, with a matte red finish. I just wanted to extend the life of this little guy, but now I have shortened it by following your instructions. I am realm broken up with this man. I love this computer, and now it has gone from a sleek, efficient, and portable tool for school to being the PC equivalent of a beater go cart…..
I’m sorry that my disassembly guide wasn’t helpful to you. The main goal of my guide is to show GENERAL disassembly steps and location of the internal components. Some people can do that and some cannot. I just provide the guide and it’s up to you to decide if you can handle it or not. Can someone tell me what size(thickness) has the thermalpad? 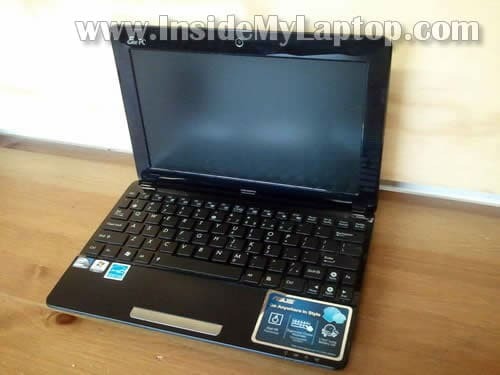 I have Asus EeePC 1011, but I think is the same. This is a badass thing you got here. I’m not the “internet presence” type, especially not to comment. 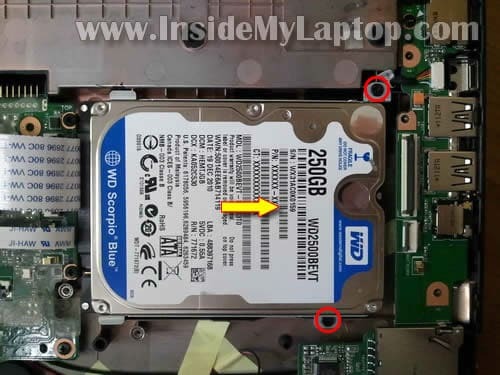 But the fact that there I haven’t been able to find anything remotely on what is the most straight-forward method of swapping the hdd from this specific netbook, and here you have this step-by-step with pictures. Thank. YOU. I don’t want to get into the dirty details of why I absolutely MUST get this netbook apart, but you are a beast man! Thanks. Hi.. Whats happend my Laptop hes not turn on.. and i see the board one Broken transistor How to Fix My Laptop.. Please Help me.. Thank you…my 1015PX hard drive failed a few months ago and I recently replaced it with an SSD using these instructions. Other than breaking a couple of the clips/latches it went OK, and the netbook is now running OpenBSD 5.8. Small donation on its way. Obviously you’re not very savvy! 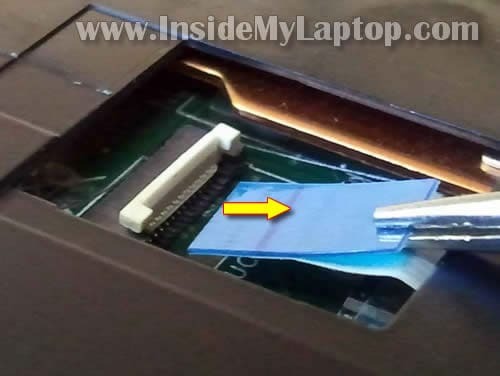 The only way you are going to damage a netbook (or any computer for that matter) is by forcing something open or apart that’s made of plastic. I’ve been building, programming and repair computers of all kinds (especially Netbooks and Laptops) for as long as they have been making the them. The guide that this guy wrote is just that, a guide so if you damaged a bunch of netbooks or whatever then obviously you have no idea what you are doing. You actually unknowing state that in your comment by telling people to take their computers to a professional which obviously you should have done yourself. Wow this tear down is really accurate. Mine was an Asus eee pc seashell w matt red finish. I was taking it apart to throw away the HDD and didn’t put it together to see if it works though. Thanks! Could you do one for the same model but regarding the Cooling Fan?. Can you do one for the same model but only regarding the cooling fan replacement?. Please!! !